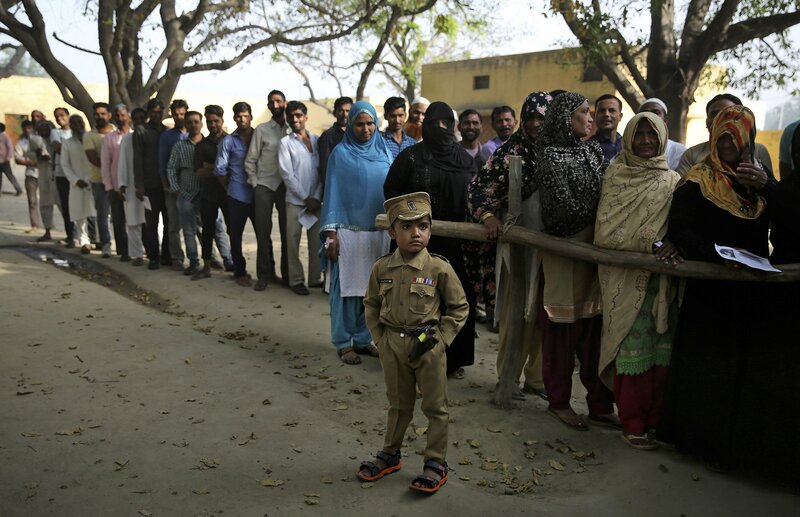 A young boy dressed as a policeman stands as Indians wait in a queue to cast their votes in village Sawaal near Meerut, Uttar Pradesh, India, April 11, 2019. Much of the world faced political turmoil this week as others grappled with extreme weather. These powerful photos capture everything from political chaos to communities dealing with the aftermath of extreme weather. Around the world, these challenges underscore why support for the Global Goals is as urgent as ever. You can join us in taking action here. In what is said to be the world’s largest democratic election, 900 million Indians began casting their votes on Thursday. Current Prime Minister Narendra Modi is up for re-election. Modi, 68, represents the Hindu nationalist party, called Bharatiya Janta Party (BJP), and has been condemned for his role in the Hindu-Muslim riots that broke out in 2002. He is running on a Hindu nationalist platform and, at time of writing, is projected to be the likely winner. In Honduras, people gathered at a bus terminal for a very different reason. A group of about a 1,000 Hondurans came together in the city of San Pedro Sula before heading towards the United States. 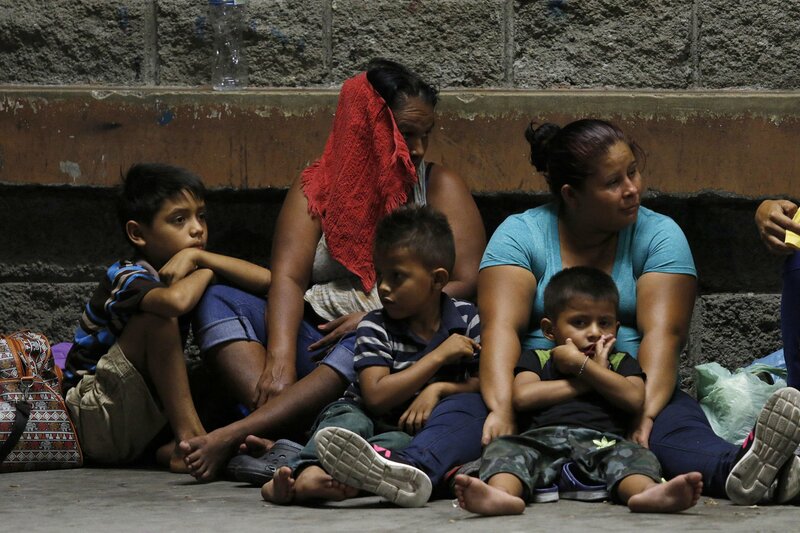 The US government announced the decision to cut aid to El Salvador, Guatemala, and Honduras last week after President Donald Trump criticized Central American countries for being unable to stop migrants entering the US. He threatened to shut down the US-Mexico border. Europe is dealing with its own geopolitical problems as the new Brexit deadline was further delayed to Oct. 31. Under the rules set by the European Union, the UK will now have to hold European Parliament elections in May or leave the union on June 1 without a deal. While some countries grappled with an uncertain future this week, others looked to the past. Rwanda began 100-day period of mourning this week to commemorate the 25 years that have passed since the start of the genocide, which killed almost a million people. A ceremony was held at the Kigali Genocide Memorial, which serves as a “final resting place” for more than 250,000 people. Heavy rains in Brazil have left at least 10 people dead. And Iran struggled with the aftermath of deadly flooding that affected 26 of its 31 provinces and killed at least 70 people. Approximately 46,000 people have been housed in emergency shelters as the country is still dealing with evacuation measures and looks for natural disaster funds. These are 12 of this week's most stunning images of a world in flux. 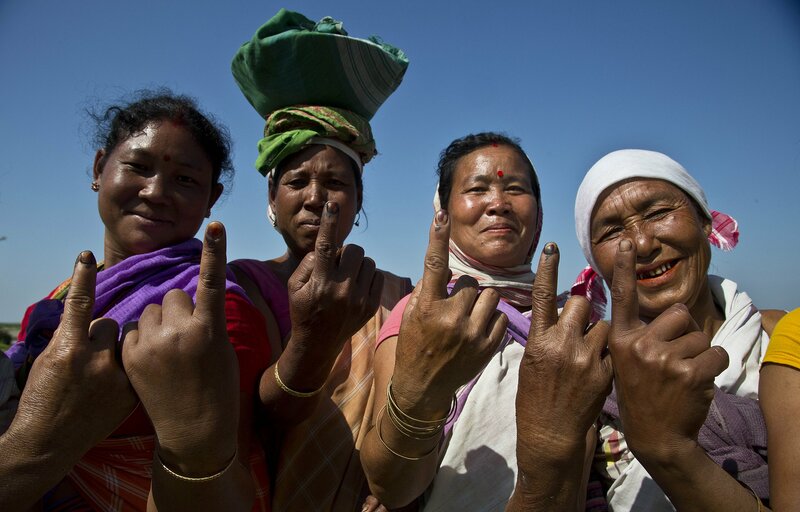 1) Elections in India: Indian Mishing tribal women show the indelible ink marks on their index fingers after casting their votes in Majuli, Assam, India, April 11, 2019. Voters in 18 Indian states and two Union Territories began casting ballots on Thursday, the first day of a seven-phase election staggered over six weeks in the country of 1.3 billion people. The election, the world's largest democratic exercise, is seen as a referendum on Prime Minister Narendra Modi and his Bharatiya Janata Party. The scale of the general elections in India is the largest in the world, with more than 1 million polling booths being set up all over the country, according to Vox. The process ends on May 19. 2) Brexit: Brexit: Activists wave EU flags near the Houses of Parliament in central London on April 10, 2019. European Union leaders announced on Thursday to extend the Brexit deadline until Oct. 31, 2019 from the originally scheduled April 12 date. 3) Central America Immigration: Migrants planning to join a new caravan of several hundred people setting out in hopes of reaching the distant United States, wait at the bus station in San Pedro Sula, Honduras, April 9, 2019. Parents who gathered at the bus station to leave with Wednesday morning's caravan say they can't support their families with what they can earn in Honduras and are seeking better opportunities. Migrants fleeing Central America's Northern Triangle region comprising Honduras, El Salvador, and Guatemala routinely cite poverty and rampant gang violence as their motivations for leaving. 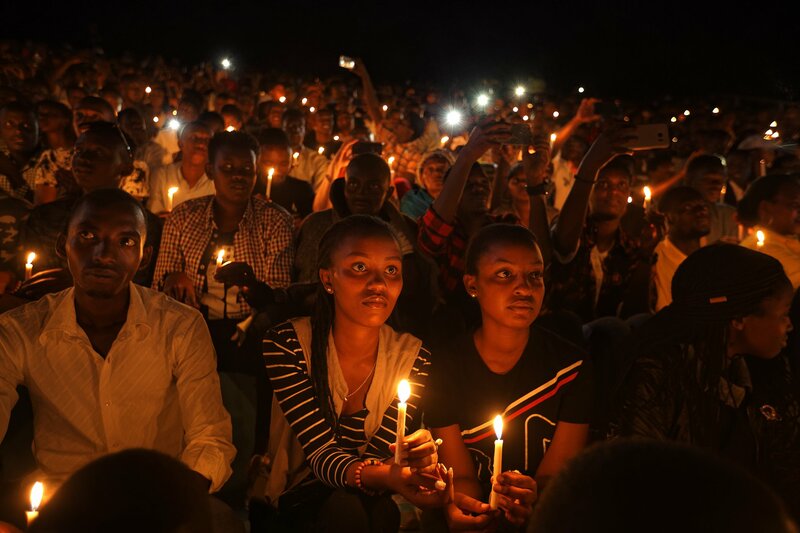 4) Rwandan Genocide: Rwandans sitting in the stands hold candles as part of a candlelit vigil during the memorial service held at Amahoro stadium in the capital Kigali, Rwanda, April 7, 2019. Rwanda is commemorating the 25th anniversary of when the country descended into violence, during which some 800,000 Tutsis and moderate Hutus were massacred by the majority Hutu population over a 100-day period in what was the worst genocide in recent history. 5) Thailand: Two men prepare to transport sacks of scrap plastic bottles for recycling in Bangkok, Thailand on April 9, 2019. 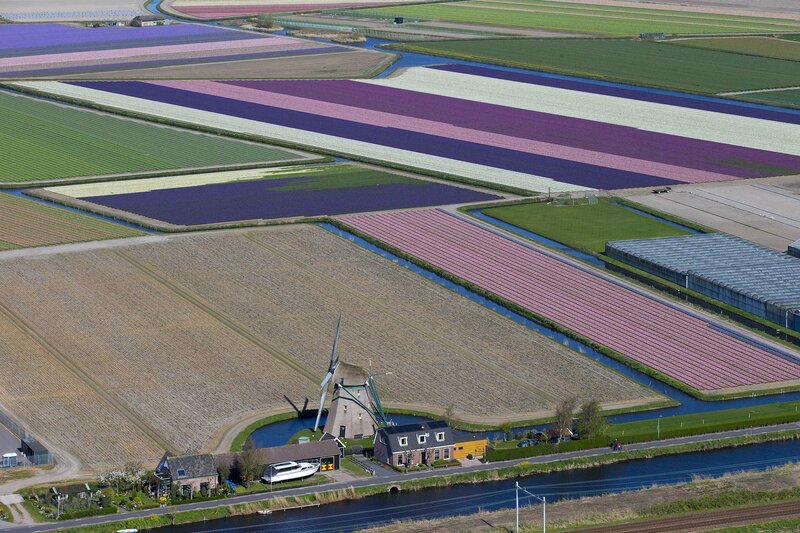 6) Effects of Brexit on the EU: Aerial view of a windmill and flower fields surrounding Keukenhof spring park in Lisse, near Amsterdam, Netherlands, April 10, 2019. For years, the Dutch agriculture, horticulture and logistics industries have been refined to swiftly deliver their produce to customers in the United Kingdom. A so-called "hard" Brexit could seriously impact the supply chain with delays expected at British and European ports if Britain leaves the EU without a deal. On Thursday, European Union leaders announced they would extend the Brexit deadline until Oct. 31, 2019 from the originally scheduled April 12 date. 7) Flooding in Iran: A general view shows the flooded city of Susangerd in Iran's Khuzestan province on April 9, 2019. Iranian authorities yesterday evacuated patients from a hospital threatened by floodwaters in the southwestern city of Ahvaz, the semi-official news agency ISNA reported. Iran has been hit by several weeks of unprecedented flooding across most of the usually arid country that has killed 70 people, according to the emergency services. 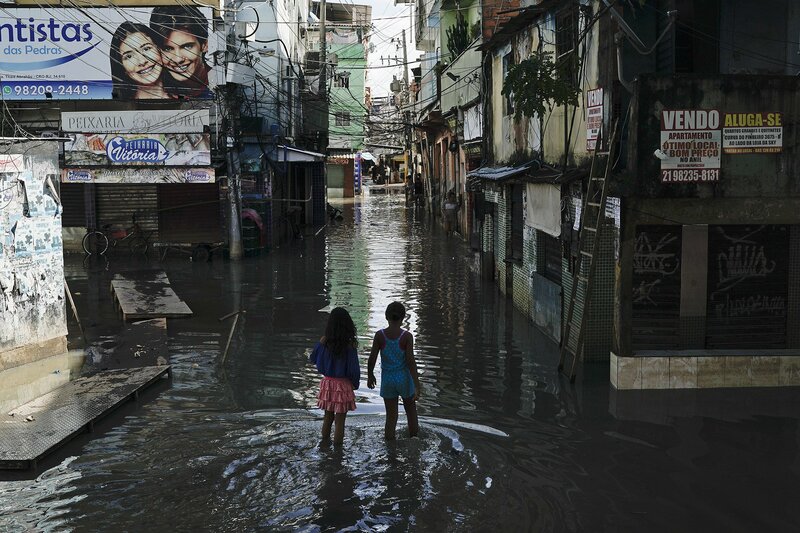 8) Weather in Brazil: Children walk through a flooded street in Rio de Janeiro, Brazil, April 10, 2019. Heavy rains killed at least 10 people and left a trail of destruction in Rio de Janeiro on Tuesday, raising questions about the city's preparedness to deal with recurring extreme weather. According to Reuters, the Mayor of Rio De Janeiro, Marcelo Crivella, described the rains as “absolutely abnormal.” Many experts predict that as climate change accelerates around the world, extreme weather events will getting stronger and more destructive, putting communities at risk. 9) Voting in the Largest Democracy in the World: A young boy dressed as a policeman stands as Indians wait in a queue to cast their votes in village Sawaal near Meerut, Uttar Pradesh, India, April 11, 2019. Voters in 18 Indian states and two Union Territories began casting ballots on Thursday, the first day of a seven-phase election staggered over six weeks in the country of 1.3 billion people. 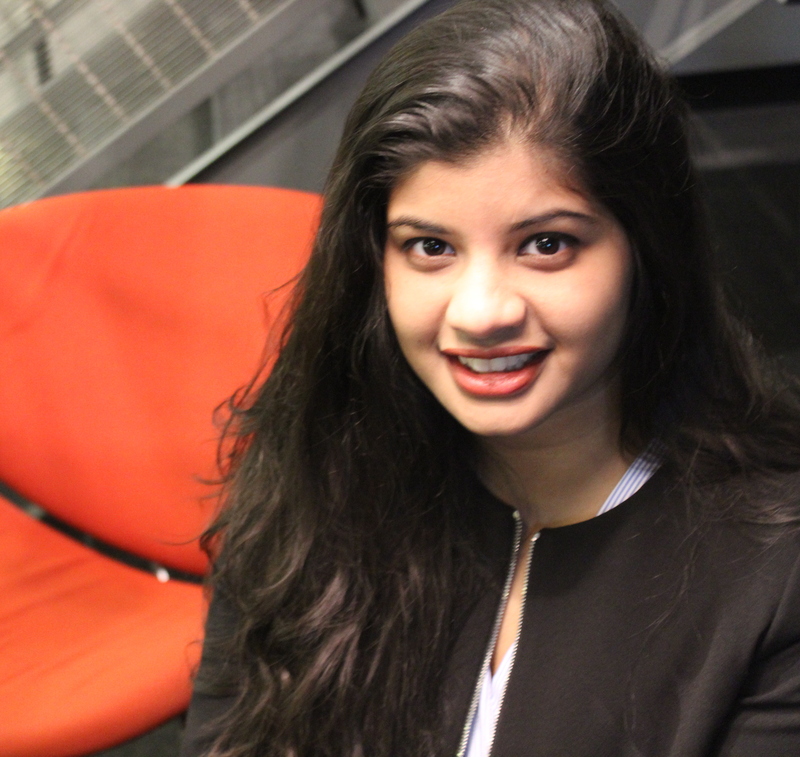 The elections in India are the world's largest democratic exercise, with 900 million people registered to vote at around a million polling stations across India. Voting concludes on May 19 and counting is scheduled for May 23. 10) Daily Life in Haiti: People play football in the Haitian capital Port-au-Prince, on April 10, 2019. According to the World Bank, Haiti remains the poorest country of the Americas with over 6 million of Haiti’s population living below the poverty line. 11) Immigration in Central America: A Honduran child and his mom are seen in a bus leaving the Metropolitan Center of San Pedro Sula, 300 kms north of Tegucigalpa, to travel to the Guatemala border on April 9, 2019. At least one thousand of Hondurans migrants including women and children were convened by social medias to a new caravan to the US. About four caravans of 2,000 Hondurans left San Pedro Sula between October 2018 and January 2019 escaping violence and poverty. 12) Songkran: Revelers and elephants splash water at each other during a ceremony to celebrate the Buddhist New Year, locally known as Songkran, in Ayutthaya on April 11, 2019.